Jamey Wright turned 39 on December 24, and he celebrated by signing a one-year deal worth $1.8 million with the Dodgers. As far as offseason signings go, it’s a relatively minor one, and coming as it did in the midst of the holiday season and the far bigger stories of Shin-Soo Choo and Masahiro Tanaka, it — quite reasonably — went unmentioned here. In fact, as far as I can tell, the last time he was even mentioned on the regular FG site was way back in 2009, and even that was a Jeremy Affeldt article that barely referenced Wright. That’s neither surprising nor unexpected, because Wright’s claim to fame — if he even has one — is that he’s been surviving on minor-league deals for longer than most current players have even been in the big leagues. After eight consecutive years making seven different teams as a non-roster invite, he’s finally managed to collect a big-league deal for the first time since 2005. That’s great for him, but is otherwise a minor piece of trivia in the larger baseball world. This is from a guy who struck out 59 in 149.2 innings as a 23-year-old Colorado starter in 1997. 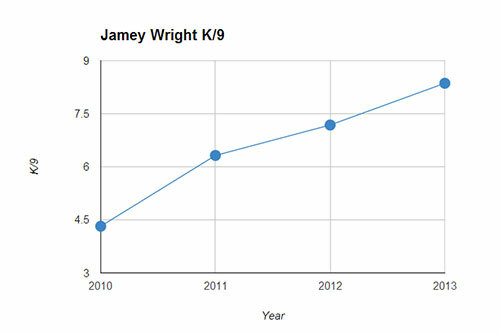 In the first 14 years of his career, Wright’s K/9 was a mere 5.0; in the four years since, it’s been 6.6. Some of that, no doubt, is due to the fact that he’s been around for such a long time — remember, he made it to Colorado before Todd Helton did, and at least four men from his first MLB game (Bruce Ruffin, Dante Bichette, Eric Young, and Shawon Dunston) now have sons in the pros — that he’s seen a sea change in the game as far as the increasing number of strikeouts. In 1996, hitters struck out 16.5% of the time; in 2013, it was 19.9%. Still, that’s not enough to explain a kind of steady improvement like that, especially at an age when most pitchers are either declining or already long gone. He has to be throwing harder, right? If anything, the exact opposite is happening — Wright’s 89.5 MPH average fastball for Tampa Bay in 2013 was his lowest since at least 2007. Wright ditched his longtime sinker in favor of a cutter — unsurprisingly, his groundball rate was his lowest since 2004, though still above-average — and started throwing a change that we’d almost never seen before. So that’s part of it; obviously, a cutter is generally more likely to miss bats than a sinker is. But there’s also this: while Wright has never really had a huge platoon split over his career (.343 wOBA from lefties, .330 from righties), he has, counter-intuitively, had more success striking out lefties. Over his career, his K/9 against lefties was 6.34; against righties, it’s 5.05. In 2013, it was 9.50 against lefties, and 6.67 against righties. Wright’s 25.4% strikeout percentage against lefties was a top 20 mark in the majors, just behind Jose Fernandez and just ahead of Felix Hernandez — great company to keep. When the Rays needed a bullpen game against a lefty-heavy Oakland lineup in September, it was Wright who got the call for his first start since 2007. Really, this is exactly the kind of thing the Rays excel in — find an undervalued asset, identify something nontraditional that he’s good at, and take advantage of it. For Wright, it’s earned him a guaranteed contract for the first time in years. Now we’ll just need to see if the Dodgers keep the trend going, or if age will finally catch up to Wright. We hoped you liked reading Jamey Wright Improving With Age by Mike Petriello! I like this! Nice work, Rays and great job Mike!